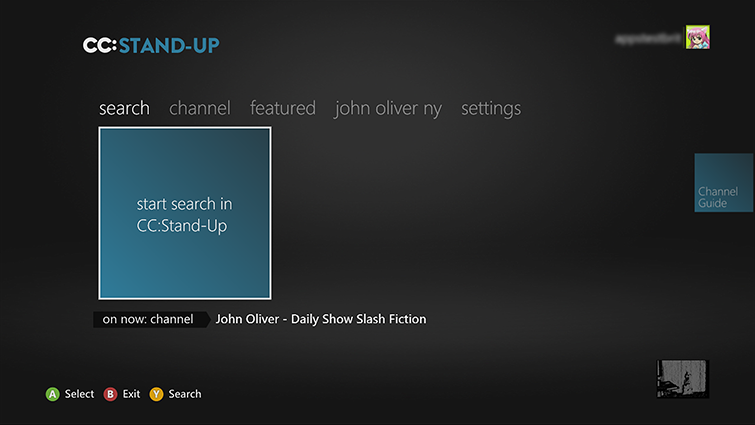 Browse or search for CC:Stand-Up app. Select CC:Stand-Up, and then select Download. To start the CC:Stand-Up app later, go to apps, My Apps, and then CC:Stand-Up. Go to apps, My Apps, and then CC:Stand-Up. Select the Channel Guide tile to browse additional channels. The Featured hub has a selection of tiles that you can choose to show a single video or a long list of featured videos. The Customized Feed Driven hub focuses on special limited-time content that you might like. 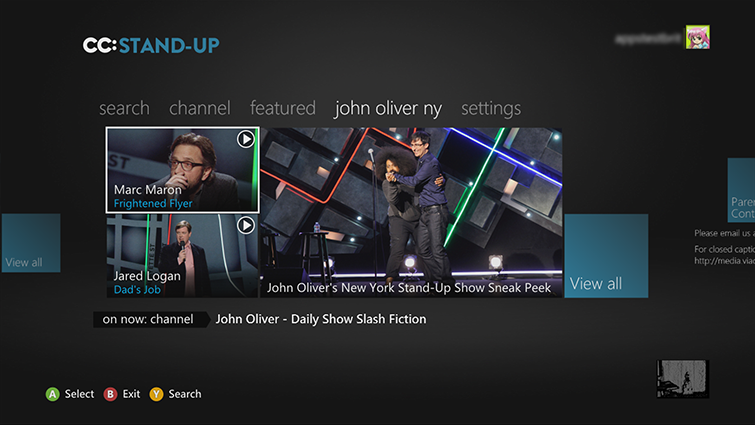 The app displays a custom header, such as “ny comedy fest” or “john oliver ny” that easily identifies the special content. 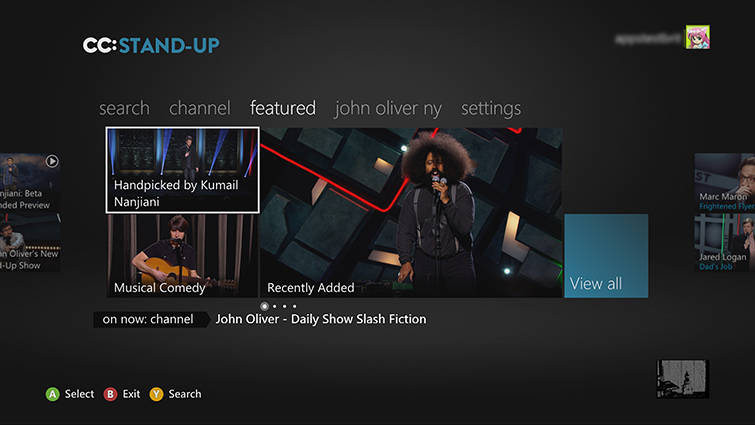 Navigate to the left of Channel hub to the Search hub to search for specific content by title or comedian. 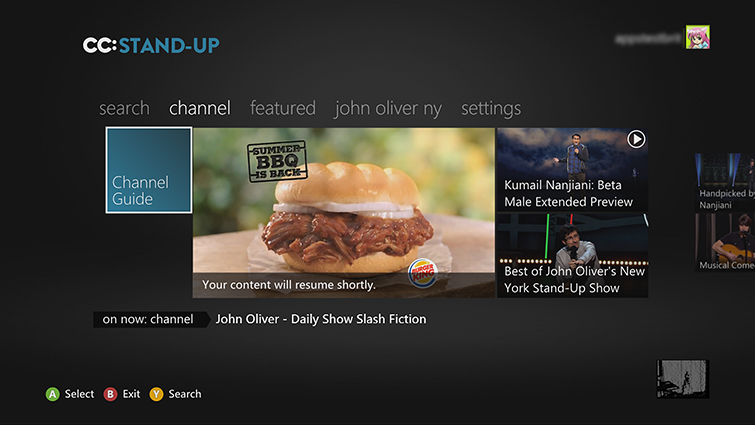 If you use Family Settings to control which movies and TV shows can be watched through Xbox Live on your console, the CC:Stand-Up app will follow those settings. For example, if you prohibit viewing of R-rated movies or TV-MA-rated TV shows, those programs will be marked with a “restricted” icon in the CC:Stand-Up app. To play a locked item, an adult must enter the Family Settings pass code. ¿Quieres contactar con el Soporte técnico con referencia al problema "Set up and use the CC:Stand-Up app on Xbox 360" acerca del que estabas leyendo o con referencia a otro problema?